BACK TO SCHOOL / STATIONERY GIVEAWAY! HEY GUYS! I'm back again with another giveaway, this time it's international! It is 'Back To School' themed. I've teamed up with Knock Knock Stationery and Tough Cookies Education to provide a mini giveaway to give one of my lucky readers some stationery and beauty goodies. 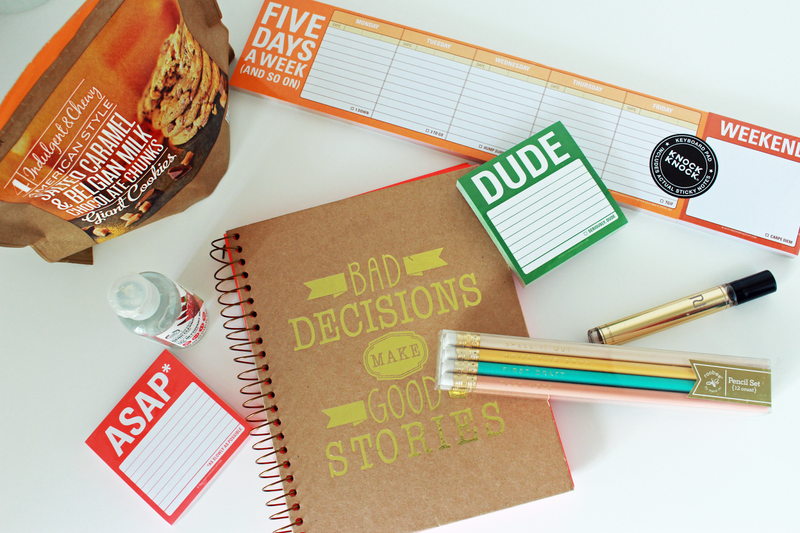 Including some funny sticky notes, a keyboard pad to keep you organised, a sassy notebook for your blogging notes, some pretty Tumblr-looking pencils and more! This is to keep you motivated and organised for the rest of the school, college, uni, work - whatever you are doing - year. Enter using the raffle below! You can also get 20% off anything on Knock Knock, by using the code 'LAURIE20' use it whilst you can! I'm also going to add some surprises! Thank you for the chance to win! I LOVE the notebook with the phrase, "Bad decisions make good stories"
I get motivted by planning my day before I sleep! People complimenting my writing spurs me on! Listening to my favourite music! But if I have to concentrate really hard, I just usually eat some candy. Getting good grades keeps me motivated! May sound weird but when I get a high grade it's like I want more so yeah! It just motivates to keep getting better and better! What keeps me motivated to do my work? Tbh I am a lazy person. But sometimes I am in kind of a spree and I plan tons of things which I complet in less an hour. But I love to watch YouTube videos from the British you tubers like zoella, pointlessblog etc and I try to be a good person, to think happy because of them. So they are kind of a motivation for me.